1. Getting ready to trek. 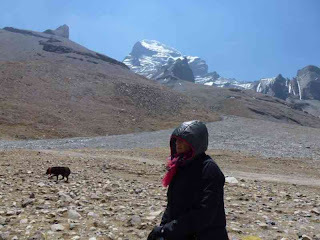 May I bow and praise our Christian God because He does not require that to have our sins forgiven we must take on such extraordinary challenges as hiking Koras around mountains deemed holy by some religions. It has been the most painful and earth-shaking challenge of my life and I'm still trying to figure out why this seemed so important to me. Thank you God that through your grace and mercy you pardon me with confession and prayer. If I had to succeed at Koras to receive forgiveness, my hope for heaven is weak. From Danchen, a small hole in the wall through which all Kora pilgrims must pass to begin the holy trek - usually spending the night in one of the "naked" guest houses (I say that because there is nothing but bed, noodles, and a distant outdoor toilet - it's a good thing the sun shines from 7 a.m. til 10 p.m. or you couldn't see without candles/flashlights) - the enthused religious wanderers set out. To be honest, most of the participants are Hindu, Buddhist or Bon. This is their thing. It's admirable because it completes undresses all your pretenses, your needs, and your considerations about your own value. The guides don't tell you the real truth about what you are about to endure. They say "oh, just a little farther" or that this is not a picnic in the park or they forget to tell you that you won't be able to go all the way on your steed. If I had known, I'd run the other direction. A true coward. 2. Ponies for a ride. 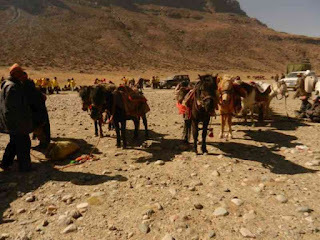 First there is the gathering of the groups and the division of yaks and ponies. Hikers are wrapped in gear sufficient to keep warm for anywhere from two to four days. They resemble giant puffed marshmallows in caps with earflaps. If you are in a big group - like most of the Indians and Russians who take on the Kora whether for religious reasons or not - you probably have a special jacket (there were the yellows (Indians) and the Reds (the Russians) and the Oranges (Italians) - and trucks load your duffle bags, blue water barrels, and eating material to the starting gate, so to speak. r beads are in my pocket, but I pray whatever the situation. To get the morning departure started (although Tibetans go whenever they wish, this is mostly for the "tour" groups with gear) the town chief has the delight of designating who gets what and how many yak or ponies. It's sort of a tense time. We were such a insignificant group (5) - needing two yak and one pony - that we would sort of win what was left from the divisions. 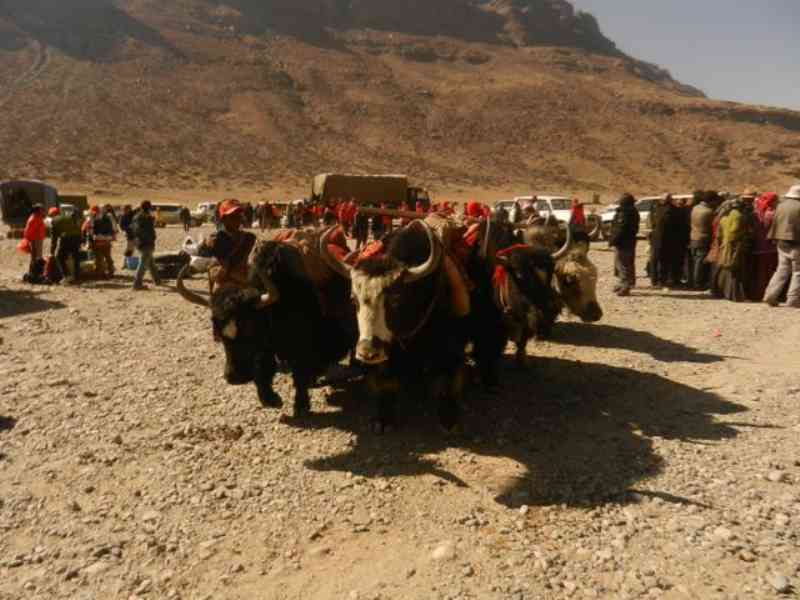 We had one yak driver and one pony puller. (Well, that's what he did). All ponies are led. Dashing around like herd dogs were beautiful black and brown Tibetan mastiffs. I want one! My group set out hiking in faith - our guide waiting for all the decision making to happen - although I kept thinking what happens if I don't get the pony promised - I'd never make it . Now this was a bit of faith on my part. We crossed a river and hiked up and down hills as I faced the fact that I am definitely out of physical strength after sitting in cars and so forth for so many days - and then after about an hour, I said, "I need a rest! " 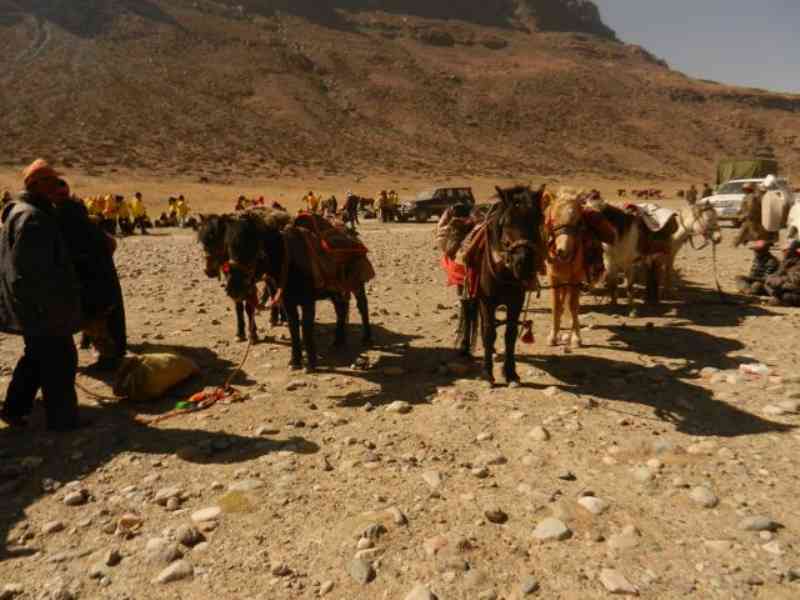 so sat on a rock and drank some water - and lo and behold, our pony showed up, with the yaks trailing in a group of other folk's yaks. Well, this brown pony, no name, was about as wide as a rocky horse and smaller than a donkey. I about died. This is going to haul Me up mountains?? He had a wooden saddle padded with some carpet like blankets but the stirrups were measured for a jockey! And there was not enough rope to let the stirrups down. Well, I knew it was going to be a wobbly event - and had to keep my legs out of the stirrup most of the time to prevent cramping and for balance. The whole thing was painful. As the sun shone on what was a beautiful but windy day and Mt. Kailash poked it's Meringue-like head into the sapphire blue air above us, I had a moment of positivity. Well, all the mountains in Tibet are stunning, enticing. Besides being impressed with the fast speed and the determined faith of the hundreds of Tibetans walking the walk, a few packing babies on their back it was incredible to learn they might be doing it for the third or fifth time (odd number required) and some, like Tashee our guide, has done it over the 13 times suggested for complete cleansing, just because he takes people on the Kora. There was a certain rhythm in the Tibetan's metered walk (none of the Tibetans would ride). 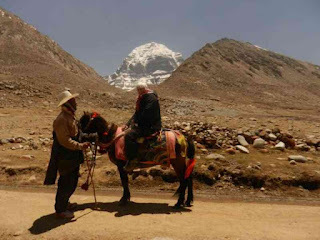 And as a bell tied to my long haired Tibetan pony's tail kept beat to his step and the sherpas in my entourage chanted the entire way I almost fell asleep. When we stopped for lunch (i had a Snickers, my life saver in years gone by) I discovered I was not the only person riding a pony. 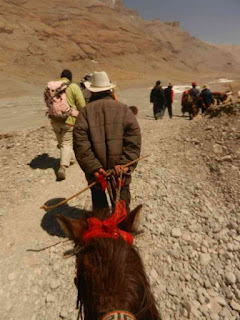 I had sort of been embarrassed by the idea I couldn't walk the Kora when so many older Tibetans did. (Ponies are also used for packs). In fact, I learned there were over 100 ponies being ridden by Indians. So I'm not so cranky or spoiled after all. 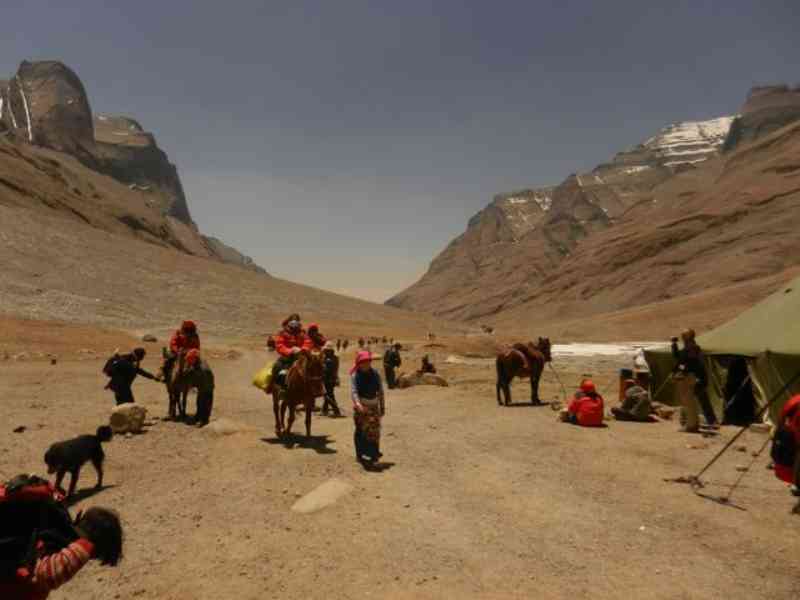 We arrived at the base of the enormous pass over which the challenge desecrates every single Kora enthusiast. Here we stayed in another guest house which was currently under construction and the concrete making machine didn't stop until about 9 at night. Of course concrete maker equaled electricity and I think for a couple hours while I slept there was a burst of electricity for quick usage. I was warm, though, because here's the layout in these guest houses: a concrete floor, a metal door, a relative mattress on a metal frame and folded up for your pleasure, a thick duvet (nothing down about it), a thick warm brightly flowered blanket, and a pillow. I'm lucky because I get a room for two and so I can rob the extra blanket and pillow and reallllly get warm. It makes for a good sleep. But imagine the shock about 5 a.m. with my tiny flashlight in hand and I stepped out of the door for my bathroom dash before the crowds set in - the whole place was packed with sleeping Yak - I mean huge black hairy guys roped to a rock, their big horns poking the air as if to make spots for new stars. The moon was almost full so, by hook or by crook, I sort of grit my teeth and tip-toed my way to the outhouse - speaking to each Yak (I mean at least 3 dozen of them) as I walked by. Their handlers were sleeping in tents, as were some of the Kora hikers. I was lucky to have a bed and a sleep. Was this bravery? I attend a silent retreat every year, and I have noticed that when you take away all the "stuff" that we use/do every day, my mind naturally turns to prayer. I would imagine that intensifies when you also fear for your life. I'm reading these in reverse order, so I know that you make it. You have a lot of guts.